In this post, we reflect upon the process to search hospitality jobs in Canada. We have tried to cover all the aspects of Canada Hospitality in detail to make it a guide for searching hospitality jobs in Canada. Canada is a country which is brimming with possibilities. Hospitality Jobs in Canada is extremely prized and thus landing a dream job in the hospitality industry of Canada is not simple. In this post, we have discussed a streamlined and structured approach to Canada Hospitality Jobs. So, read on for a detailed guide. Recently, there has been a large influx of immigrants from all over the world to Canada which has increased the size of the market and the market has responded by increasing the number of jobs available. Though the number of jobs has improved in all industries, this is especially true for the hospitality business. This posts will work you through the below checklist to give an idea of the Canadian Hospitality industry and approach the job search in Canada. Rest of the post discusses these points in greater details. But, before we get on with the list, here is a 1-minute video on hospitality jobs in Canada. The video outlines the key points to be considered while approaching your hospitality job search in Canada. We will look at these in detail in this post. Just a word of caution. This post is a free resource to guide you in almost every aspect of your prospective hospitality job search in Canada. This post covers various aspects and information on how to get hospitality jobs in Canada. We don’t charge or offer any hospitality job-related services for Canada. Neither do we endorse any agency or website that charges you for any of the services. This post is a free step by step guide to simplify the process of searching hospitality jobs in Canada and we are not providing any shortcuts as “There is no shortcut to success”. Let’s get on with the details now. So, read on. Also, have a look at our other resource about J1 Visa of USA for those looking for cultural exchange programs or internships in the USA. For those looking to build a career in Middle-East can have a look at our posts on the Hospitality industry of Dubai. But, before you start looking at other resources about the Hospitality industry around the globe, please go through the details in this post about landing Hospitality Jobs in Canada. When the whole world is reeling with unemployment woes, Hospitality and tourism sector is creating millions of jobs. Canada has a fair share of these newly created hospitality jobs. Have a look at the below infographic by Hilton Worldwide. 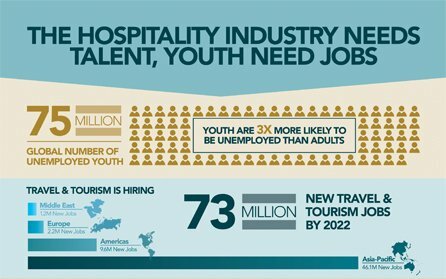 US and Canada need around 10 Million more hospitality professionals by 2022 and are behind only the Asia Pacific in terms of employment rate. Tourism and hospitality jobs in Canada are expanding by defying all odds. The hospitality industry is an extremely diversified industry which includes services like lodging, transportation, event planning and some related fields in the tourism sector. The different forms of transportation such as airlines, cruise lines etc. are also considered a part of the hospitality industry. Canada Hospitality jobs can be segregated into a lot of sections. Here is an interesting fact about hotel jobs in Canada. According to the Hotel Association of Canada, as per the figures of 2016, there are 8,139 hotel properties in Canada with approximately 443,000 rooms. These hotels employ close to 300,000 employees. The number has increased further in 2019 and is expected to grow further in the coming years. 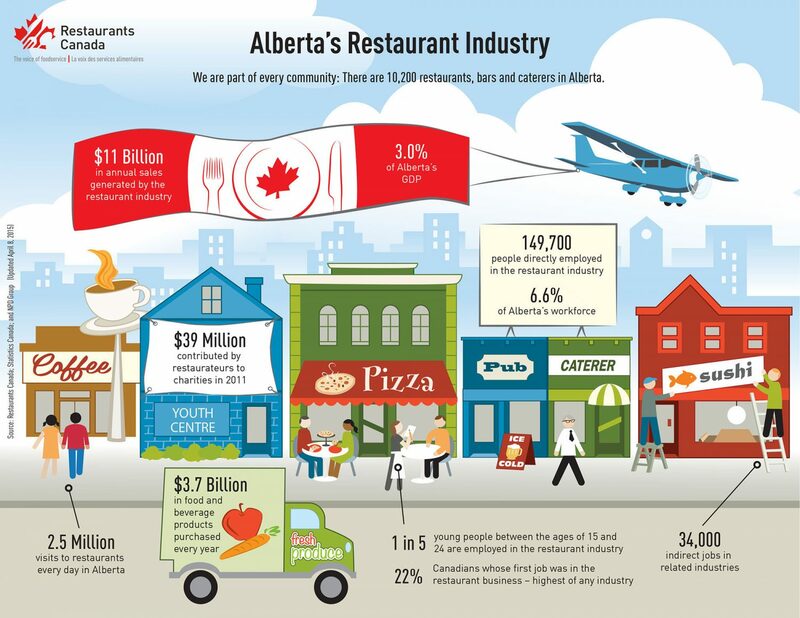 Restaurants are the key contributors to the hospitality industry in Canada and develop almost a quarter of the total jobs in Canada. The story is similar across Canada with restaurants becoming a key contributor to hospitality jobs in Canada. Seasonal hospitality jobs in Canada has taken a leap over recent years. Canada has been welcoming immigrants for many years. The size of the country and its huge coastline also make sure that the Cruise industry and Aviation sector flourishes alongside the Hotel and restaurant sector. However, the attractiveness of the country, it’s somewhat easier immigration norms, and salary offered has been a major attraction for hospitality industry professionals worldwide. Searching hospitality jobs in Canada is thus not everyone’s cup of tea as there is always a huge competition. In the next points, we will try to simplify the whole process of applying for hospitality jobs in Canada. Applying for hospitality and tourism jobs in Canada involves certain steps which need to be followed. Furthermore, searching Hospitality jobs in Canada is comparatively an easier process, in some ways, for the locals as compared to the immigrants from across the globe. The first step in applying for a job is getting a Social Insurance Number (SIN) which is a nine-digit number required to get access to jobs and benefits from the government. You must also have prepared a résumé or a curriculum vitae (CV) before you apply for a job regardless of the nature of the job. A cover letter is sometimes also very important as a good cover letter can leave a good first impression which is the first step in getting a good job. After you’ve got your SIN and prepared all the documents, you should be all set in the basic things for applications. For hospitality professionals who are not from Canada need to know a few more basics. If you already are aware of your trade and want to check if it comes under the approved categories, you can search the directory of occupational profiles. Professionals from these categories are in great demand in Canada. If you don’t fall under ‘do not require work permit’ list (most the hospitality professionals don’t fall under this category), then employers have to get a Labour Market Impact assessment to hire international employees under the temporary foreign worker scheme. The full details can be found through the link on How to apply for Work permit? For hospitality professionals who have queries regarding immigration eligibility and methods of immigration can visit the authorized site by the Canadian government regarding immigration services of Canada. There is ample resource on the web to explore salaries on hospitality jobs in Canada. We recommend Payscale and Glassdoor for your initial research on various salaries. Our post on Hotel Management salaries should also help in your research on exploring salaries of various types of job roles in the hospitality industry. You might think why you should be bothered about these before you start applying. It is important for three reasons in particular. If some fraudulent companies approach you with unrealistic salaries, you are safeguarded. You can negotiate well during your job interview. You can have an estimate of expenses and savings to check if it is a good idea to leave your current job or not. Do your research on the cost of living in Canada as well to help you in judging the salaries and savings. Also, get some idea about tax deductions, housing facilities etc. as that will again help you stay away from fraudulent offers. The hospitality industry in Canada is booming despite the recession worldwide which means it is able to meet up the challenges it faces with an iron fist. Hospitality job in Alberta along with Calgary has seen a recent boost and thus these are areas worth exploring in Canada. Many of the young graduates are trying to find jobs in this industry and many have been quite successful in this regard. Due to the fact that the hospitality industry is prospering each year, we find many hotels and restaurants making it to the list of top employers in Canada. If you want to work for the biggest employers in this industry, then you definitely need to go through the below list attentively. Please click on the title should you need to research on these employers further. Delta hotels and resorts are based in Toronto and consist of hotels, restaurants and leisure activities. Their major individual development plans are developed by the leadership management teams as well as peer feedback. In addition to this, their promotions are majorly from within. They also encourage and motivate their employees by various incentives like employee recognition and other such activities. These internal endeavours are then combined with outside firms to arrive at fruitful results. Thus, due to such efforts of the employers in Delta hotels and Restaurants, they have made it to the list of top employers in the hospitality industry in Canada. Situated in Vancouver, Earl Restaurants Ltd definitely is among the world’s most favourite employers, let alone Canada. With its 65 restaurants, it is one of the best restaurant chains in Canada. This chain has been one of the favourites for job-seekers looking for tourism and hospitality jobs in Canada. The best part is that each employee is trained for a period of one year where leadership pays the cost of the books and culinary required for training. All employees can participate in various personality development courses. Furthermore, employee awards include trips and wine. The trips are destined towards some of the finest locations in the world like Japan, France, and Napa Valley in California. Another one from Vancouver is the Flight Center in Canada which is one of the best travel firms in Canada. In its network, it has restaurants, hotels as well as leisure centers. It offers exciting opportunities in the travel and tourism sector. The best thing about the leadership in this center is the fact that in-house wellness and financial consultants give fruitful advice and training on fitness related services as well as monetary aspects. It believes in choosing from within so mostly about 90% of the leadership is chosen from already existing employees. In addition to this, it also offers rewards to employees and the most motivating ones are visits to annual seminars. Keg Restaurant Ltd is a renowned name in the hospitality industry in Canada which also makes it to the list of top hospitality employers in the country. It is a chain with over 100 restaurants all over Canada. This must be on your list if you are looking for hospitality jobs in Canada. Its corporate centre is located in Richmond B.C. and helps a great deal towards the development of work-related skills as well as those related to real life for younger and newer employees. It also encourages “promotion from within” policy and offers 40% off on food even on trips that are not related to work. It has amazing events for employee recognition and other staff events and also spends in the direction of helping youth mentorship programs. Apart from these, there are hotels like Fairmont, Hilton Worldwide and Hyatt along with global Chains like Pizza Hut that top the chart in terms of generating hospitality jobs in Canada. You can also look at the career pages of top Hotel chains to look at the existing vacancies they might have in Canada. If you are looking for Cruise Jobs our resource on best Cruise lines and their career sites might help in the research. Hospitality consultancies are very useful for helping you no matter what section of the hospitality sector you belong to. Such consultants discuss with you the bright career prospects in a job, your eligibility and help find suitable jobs for you. These consultancies have job portals where you can sign in with a username to know about the progress of your recruitment. In addition to this, these career portals give information about hotel jobs available and the eligibility criteria for such posts. You can start searching for jobs in Canada through our Search Jobs page which is a free resource for hospitality jobs from all over the world. Jross Hospitality recruiters are one of the most trusted Hospitality consultancies run and managed by the people from the Hospitality industry. They are having several offices and have a huge hospitality network across Canada. Serving the hospitality industry for more than four decades, Renard International Consultancy is an experienced and dedicated center for you. It ensures 100% client satisfaction so that the clients get exactly what they are looking for. It helps provide clients with cost-effective recruitment plans which help employers find the right candidate. In this way, it also helps potential employees find the best jobs for themselves. It ensures that the hospitality business gets the most committed and motivated employees and the employees get the top employers. If you are looking for Executive Hospitality Jobs in Canada, this might be your best bet. It is a leading recruitment and executive firm which also provides career opportunities for job seekers. It ensures that a hospitality company gets the ablest and competent leadership due to the fact that it possesses great experience in this field. There are several other avenues to look for hospitality jobs in Canada like Workopolis which also has a lot of restaurant jobs available. Visit our post mentioning the top 9 hospitality portals of the world to apply for Canada jobs. If you are looking for Cruise ship jobs in Canada then you might find them through the recruitment agent list of Cruise lines Jobs. If the offer is too good to be true, probably it is a fraud job offer or a fraudulent immigration offer. Please do not pay anyone anything before going through things in full details. Getting hospitality jobs in Canada in a tough nut to crack. So if you get things easily, be careful. Just don’t get into the trap. Read the official statement from Canadian authorities about fraudulent immigration and job offers. Building a strong network of contacts can also open many doors of opportunities for you. It helps in sending out the message that you’re looking for a job. This is especially important for the hospitality industry. Look out for the social media circle of Canada to explore Canada hospitality jobs through your developed networks. The most popular one still is Linkedin and you must join groups that have information on Jobs in Canada. Some of the popular LinkedIn groups are ‘Canada Jobs’ and ‘USA Canada Chef job jobs Chefs Restaurant Luxury Hotel Hospitality Manager’. It is also advisable to follow a few top Hotels of Canada and hospitality influencers of Canada. Look out for more advises in one of our resources which explains how to search hospitality jobs through Linkedin. Twitter is a strong social networking site, particularly in the USA and Canada. It is always good to have a Twitter account and you can follow quite a lot of job consultancies and immigration consultants to get regular updates about hospitality jobs in Canada. Sites like Nimble can also be used to build effective networks. Just to make sure, you don’t forget, it is important that you keep yourself away from the temptation to use shortcuts. Check earlier points which have ample instruction and resources on employers, agencies and job portals. Please use these along with your social network to look for a suitable job. Job search is a heartbreaking process. You need to keep trying to be successful. If you are consistent with your job applications and utilize the above resources and information, you are sure to land a decent hospitality job in Canada soon. Give yourself a 3-4 months’ window to prepare well and apply through trusted sources only. To enter into the hospitality business, you must learn to effectively sell yourself. Effectively selling yourself can mean a lot of different things but the first step in selling yourself is to know yourself and your strengths. You must highlight those strengths and share your experiences with a passion. You need to show this at the time of application and then at the time of interview. Here is a 2-minute video to show how to approach an interview either face to face, Skype or telephonic that might help the cause of your Canada Hospitality Job search. It is also important to know about your long-term plans. A person who knows where he or she sees himself/herself in the long run in the hospitality industry has a much higher chance of breaking the entry barrier as compared to someone who doesn’t appreciate the power of dreaming. Learn about the company you’ve applied to as it determines the experience you need to be considered for the job. Large businesses, the likes of hotel chains and airlines, take the time to train new employees while smaller firms typically look for individuals who have experience in similar positions. The hospitality industry is a general classification of fields inside the service industry, all the more particularly, the tourism industry. The functioning of the hospitality industry depends on the accessibility of free time and disposable earnings. Communication– when in the services industry, you always have to be on your toes, to serve. Serving also requires you to communicate well with your customers. Communicating involves you to listen well, speak well enough to get your message through and have the ability to resolve the issue. Awareness– Having experience and understanding of business and situations along with interpersonal skills to handle situations well. So if you have these skills, good! And if not, try to develop these soft skills so that you can get through the job interview easily. Getting a job in the services industry can be a challenge but, if you have these skills and are confident about it, there is no way that you would not be able to get in. So be sure that you have what it needs to get a job in the hospitality industry in Canada, and your ‘how’ will automatically be answered. Let’s say if you have received a job offer from Hyatt, Toronto, they must be aware of the same. Is that not common sense? So, it is important just for the sake of verification to check from your employer. You can be smart in terms of asking so as not to sound stupid while cross-checking the offer. Get the email from the official website and drop a thank you email. Connect to the HR Manager on LinkedIn and then thank him/her. Call the Human resource department of the company to check some details of the offer or to confirm the joining date. Mail the human resource department if they would need any other documents or references. Make a couple of friends in the hospitality organization on Facebook and LinkedIn who could get this cross-checked. Also, if you find something fishy, you can check from the consulate about the authenticity of the job offer which you have in your hand. It’s better to be disappointed now than once you have lost your time and money. Thus, it is always good to cross check. So, just reach out to your local Canadian consulate through email or phone and get your offer cross-checked and authenticated. It is also better to do this as the place would be familiar and comfortable to you when you approach the consulate again for your work visa. Now when you get over the gruelling tasks and start basking in the glory of securing the dream hospitality job in Canada, don’t forget to organize your travel properly. What’s the big deal you might be thinking? You will be scrutinized properly before you are allowed to enter Canada. So, go through the checklist before you start partying and celebrating your success. Do you have all your documents organized? Have you applied for and received your Visa? Do you have your police clearance certificate from your home country? Have you got the medical done as this is required for nationals from many countries? Do you have the Canadian Dollars needed for your first month as the first salary is a month away? Take some extra cash along to be in a safe zone. Do you need to book your air ticket yourself? If yes, book before the airfares take a leap. Have basic amenities ready and packed. Arrange for your hotel booking if it’s not prearranged. Hope you found the list interesting and informative that reveals the process of approaching Hospitality jobs in Canada while providing useful resources to get started with your hunt.